The political remap of Washington State, which occurs every 10 years, means major changes for Sammamish. The City remains in the 8th Congressional District (Dave Reichert), which now extends across the mountains to Chelan and Kittitas counties (and making it a safe Republican district). The big change is in the Legislative Districts. The City has been part of the 5th Legislative and 45th Legislative districts since before I’ve lived here (1996), primarily the 5th. Now, Sammamish will be in the 45th and 41st. Here is a PDF of the map, which isn’t too precise. The darn thing doesn’t even show Lake Sammamish. Zoom in to 400% to make it readable. This Google Earth overlay works better. The 45th covered eight precincts in far north Sammamish, with the rest of the city in the 5th. Now the split comes down to Thompson Hill Road, following this along 212th and then on a straight line across SE 8th. The north half is in the 45th and the south half in the new 41st, which previously ended in western Issaquah and covered Mercer Island. 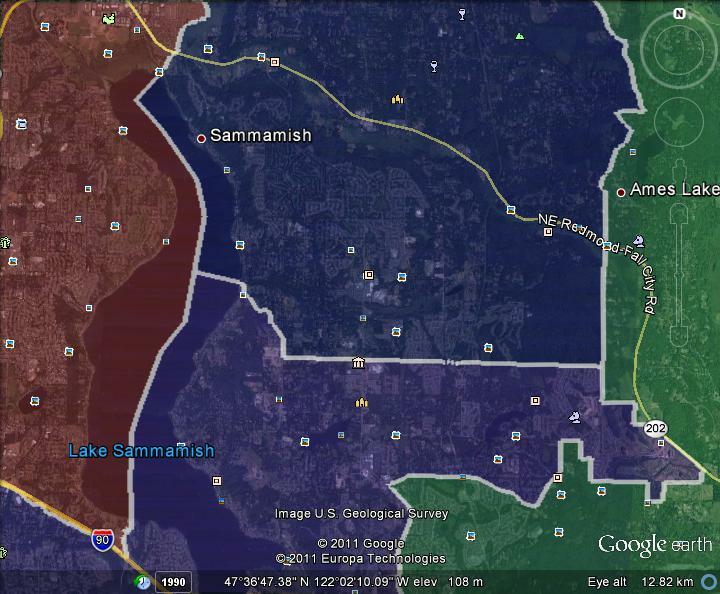 This redistricting may give Sammamish more clout in the Legislature. Whereas the 45th politicians previously only had to deal with eight precincts in the city, how half of Sammamish will vote for them. On the other hand, we’re not the tail end of the 41st–albeit a fairly big tail–but the core of the 41st still rests with Mercer Island.